If you are a license owner or license admin, when you click on the Manage cog on the summary page you’ll see the detailed view for that product. In the left section you will find a summary of your license and how it is currently being used. To the right is the Current allocated users section where you can invite and manage the allocated users of the license. In the past Redgate products could be activated using just a serial number. 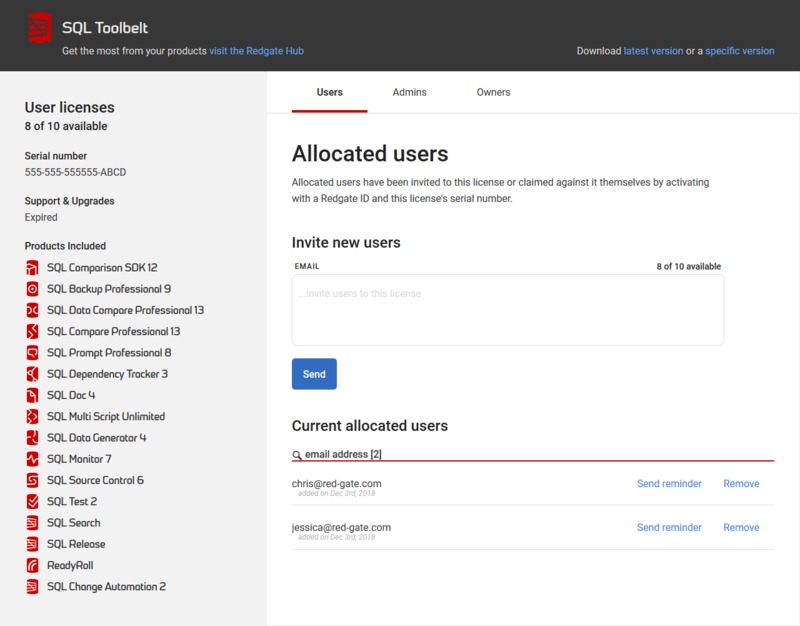 In order to make it easier for you to manage your licenses and know who’s using a product, activation in some of Redgate’s desktop products now also requires users to log in with their Redgate ID. To invite a user to use this product license, enter their email address in the input field and click Send. They’ll receive an email saying they’ve been invited to use a product. You can also enter multiple email addresses to invite more than one user at a time. The email includes a link which, when clicked, takes them either to a page where they can create a Redgate ID (if they don’t already have one), or to the Redgate ID login page. Once they’ve logged in, they’ll be taken to the product summary view in My Products, where they can get the serial number which is needed to activate the product. You can invite as many users as you have licenses for the product. When you’ve reached the maximum number of invitations, you’ll see the message No license invites available at the top of the page, and the invitation functionality will be unavailable. In this scenario, you must first remove one of the existing identified users before you can invite another user. To remove an identified user, click on the Remove button alongside their details in the list. Then confirm the removal by clicking the subsequently displayed Remove button to deactivate them. A message will be displayed confirming that the user has been removed. This has the same effect as someone deactivating the product on their computer.